Monday was declared a no nap day by Amelia. 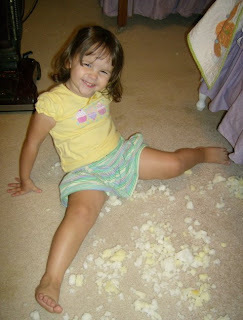 Instead of napping, she decided to pull the fluff out of her pillow. Fluff everywhere. I'm not sure if the memory foam was better than if it had been feathers. The following is what took place when it was time to clean up the fluff. After getting up as much as we could by hand it was time to employ the vacuum. I am guessing that you had calmed down before taking video. You just seemed so nice about the whole thing. I am not sure I would have been so nice. What a mess. Too bad she's scared of the vacuum. Hilarious. Oh, and Amelia is just too cute! She looks just like you did. Charlotte seemed content to crawl in the fluff. There must some child-labor laws against making your kid vacuum at such a young age. Nevertheless it was possibly the most HILARIOUS thing I've seen all week. I was laughing so loud at work that everyone wanted to know what was so funny.